Although CYP-enzymes are mainly responsible for drug metabolism, a significant part of metabolism can be mediated by other enzymes too. The emerging importance of these non-CYP enzymes is also emphasized in the regulatory guidelines by FDA and EMA. According to the regulatory authorities the involvement of non-CYP pathways should be elucidated if thought to be involved in drug clearance, while the reaction phenotyping information is necessary for predicting possible drug-drug interactions. 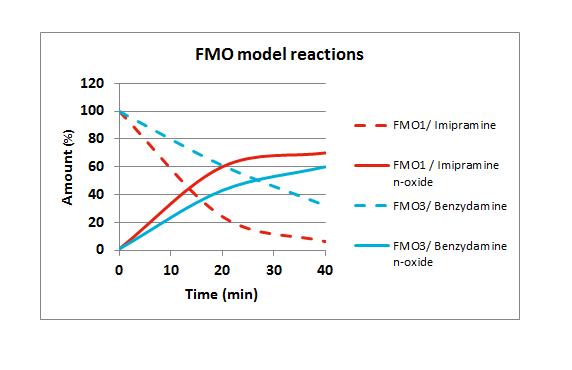 The established metabolism and reaction phenotyping assays are available for flavin mono-oxygenase (FMO), monoamine oxidase (MAO), N-acetyltransferase (NAT), sulfotransferase (SULT) and glucuronosyltransferase (UGT) enzymes. The assays are conducted with recombinant enzymes in the presence of enzyme specific inhibitors and LC/MS-MS endpoint. At the moment non-CYP inhibition assays are available only for UGT enzymes, but will be launched soon for the other enzymes too.